Happy Buy A Friend A Book Day! Looking For A Book To Buy A Friend? 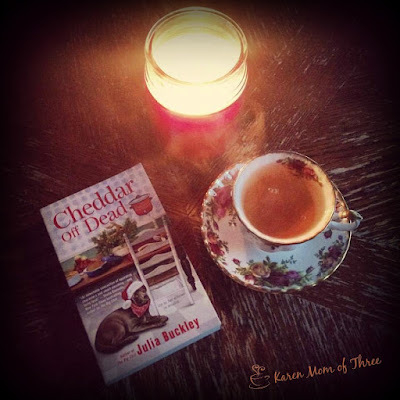 I Recommend Cheddar Off Dead By Julia Buckley! Today is Buy A Friend A Book Day and Saturday Night I finished Cheddar Off Dead by Julia Buckley. I loved it so much I can absolutely recommend it for buy a friend a book day! This book releases September 6th and you can pre order it by clicking here from The Book Depository and here from Amazon. If you buy them today I promise they will count for Buy A Friend A Book Day. I enjoyed this book so very much! Finishing it on a Hot August night and feeling that Christmas Feeling, was a delight! 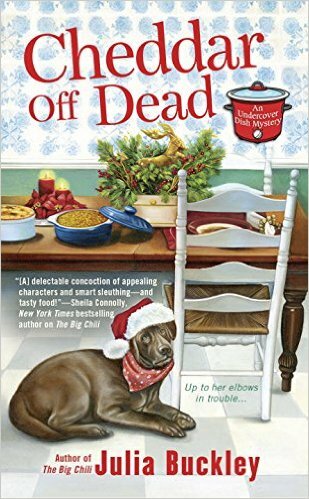 This is the second book in the Undercover Dish Mystery series and I love not only the concept behind the series but all the amazing characters in this book. The mystery is of course a key point of any great cozy and I love how this story and mystery unfold. I could so easily relate to Lilah's sudden case of holiday apprehension, the less then idealistic feelings one has at time of year and the feeling of being weighted down when the world is supposed to be swept up in holiday joy. On the flip side though I found this mystery to actually be quite up lifting and I did find that I had that old Christmas Spirit while I read. Lilah has a great family, dog, neighbors and job. 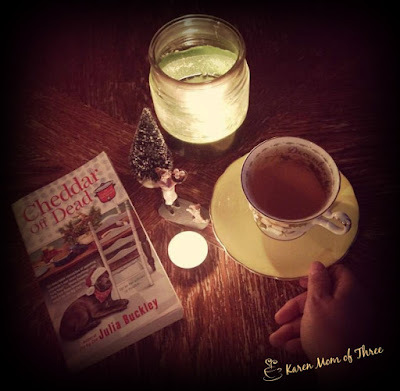 Author Julia Buckley does a wonderful job with this book and wraps up the story as a perfectly wrapped gift, proving that good things come in small packages with Cheddar Off Dead. I also love the cover art for this series don't you? 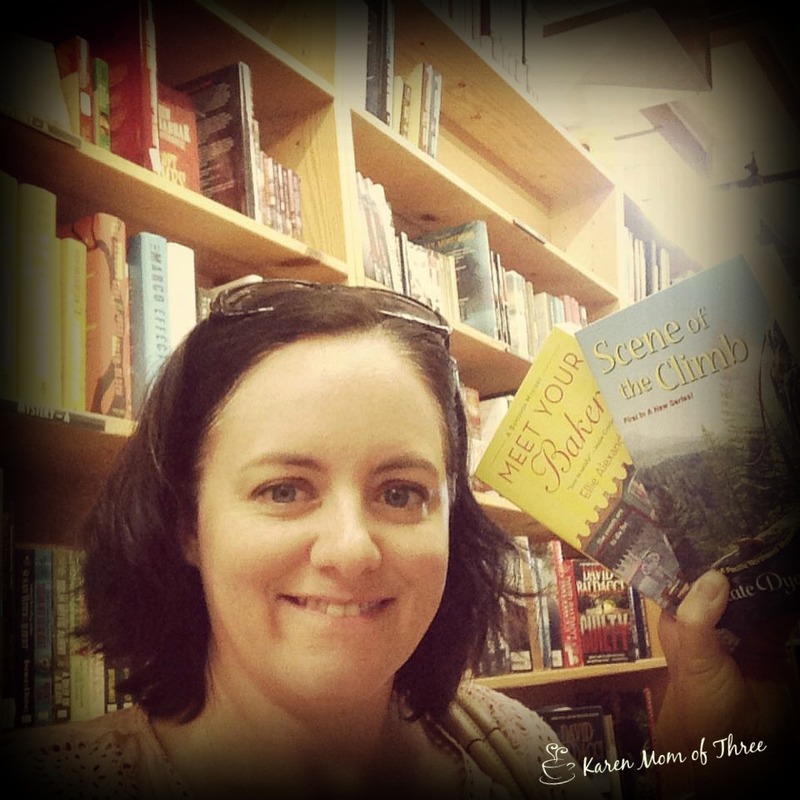 Learn more about Julia Buckley and her series by clicking here for her Author Website. 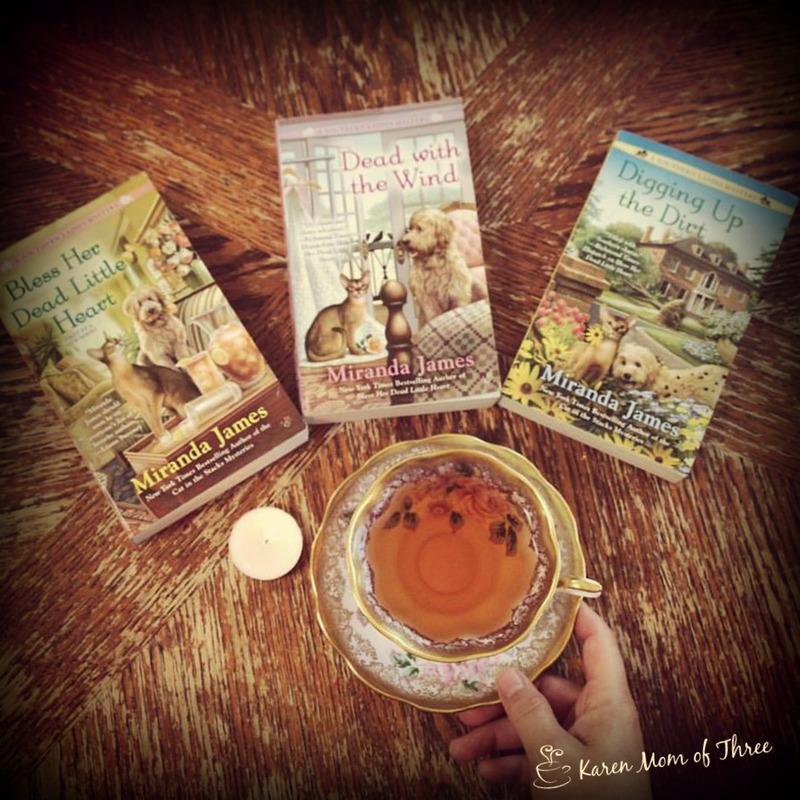 Miranda James has the third book in the Southern Ladies Mystery Series coming out September 6th and it is my favorite of the entire series. I love that the main characters in this book are in their 80's. That these characters are so full of life and so relevant, active and important members of their community. 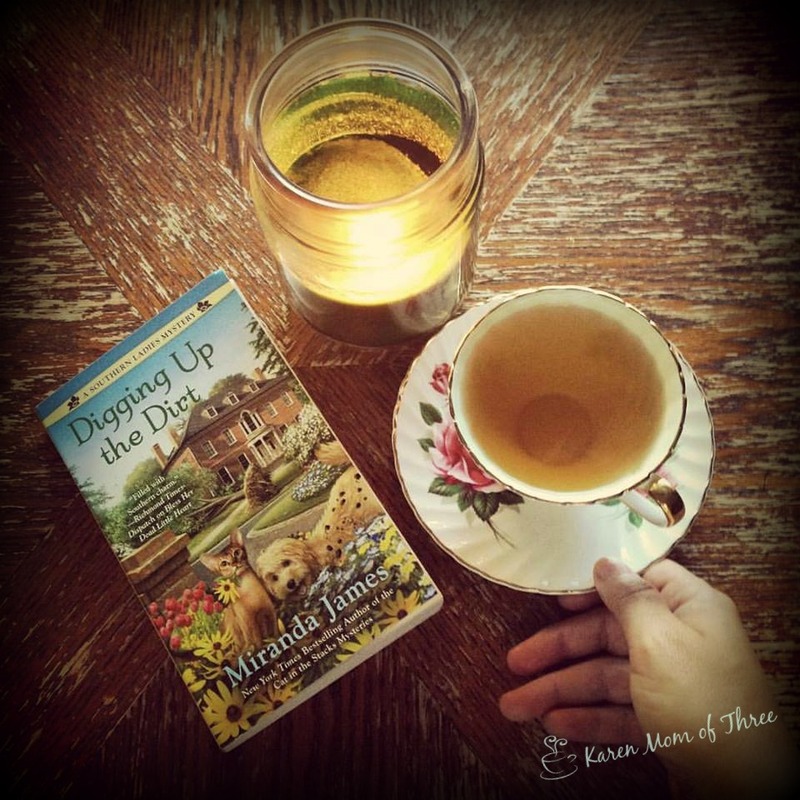 The story behind the mystery in Digging Up the Dirt is exceptionally well written. I was easily transported to Athena, feeling like I was a guest in the Ducote sister's home as well as an active member of the Garden Club. 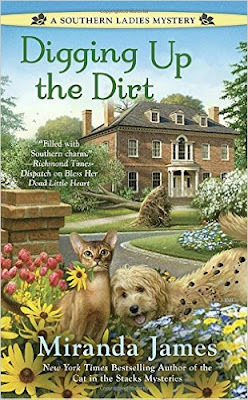 I was very happy with the story line of their ward Benji as well as the mention of our good friends Charlie Harris and Diesel from James' Cat in the Stacks Mystery series. 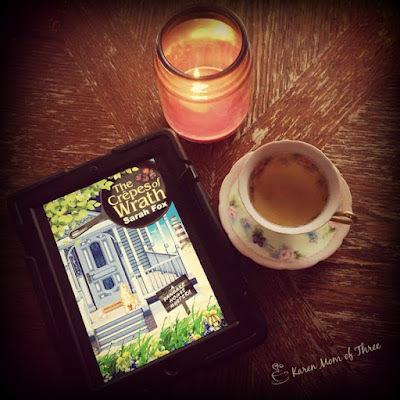 I hung on every southern word and heard that wonderful southern drawl come through as I read. 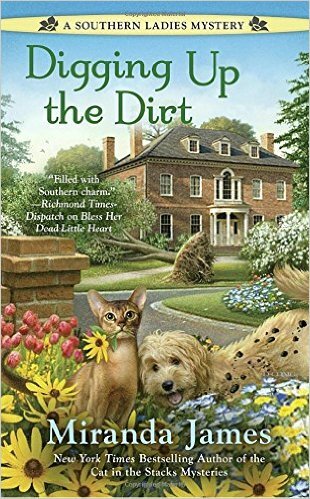 I very much hope that the characters that are introduced in Digging Up the Dirt make appearances in up coming mysteries in book 4. I think this series really speaks to the need of characters of all ages and the Ducote Sisters are proving that main characters of older ages are viable, fun and much needed. 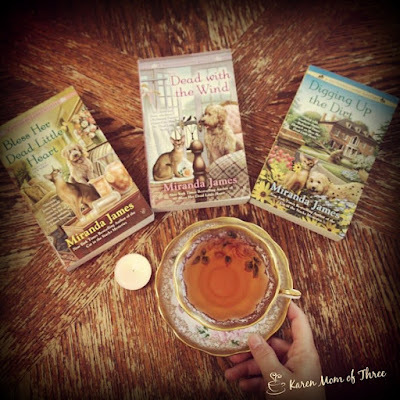 A Southern Ladies Mystery by Miranda James has fast become a favorite of mine. I hope you will give them a try! To find out more about Miranda James and this series please click here. The Book Depository please click here. There is something so wonderful about the gift of the perfect book from a friend. 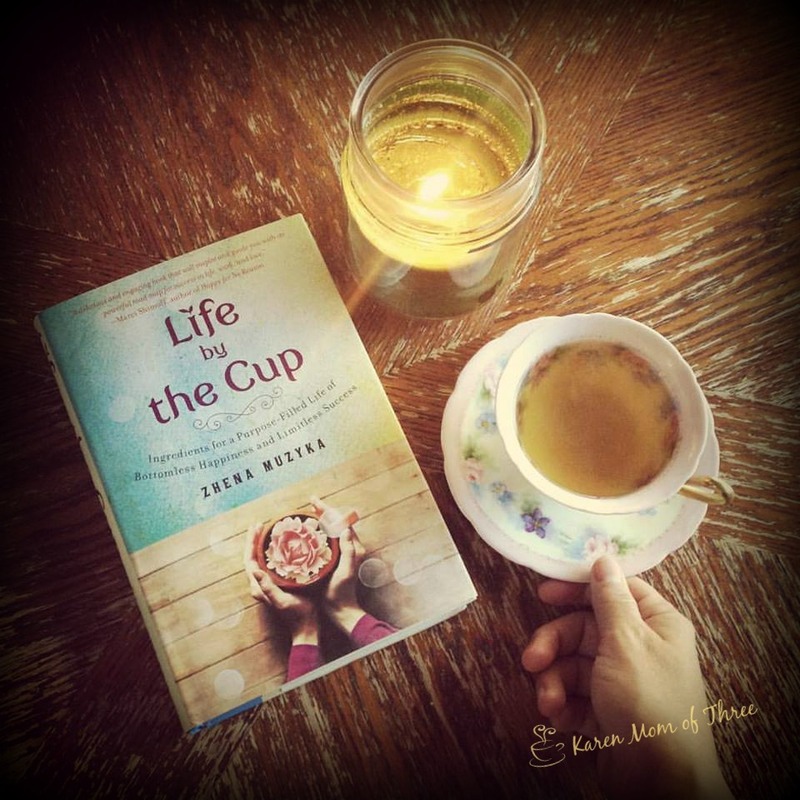 My friend Lisa K sent me Life by the Cup a memoir and self-help motivation book by Zhena Muzyka, founder of the Zhena's Gypsy Tea Company. This lovely gift arrived a week ago and it took me not time to inhale this book, something that I reserve usually for cozy mysteries. I loved the way this book is laid out and layered with personal history, struggles and strategies used to lift the reader and motive a new perspective on life. There is fascinating and practical advice, something for everyone in this book. I very much appreciated the raw emotional journey as well as the powerful suggestions and themes of perspective taking, calming strategies and ways for personal growth. The tea line is delightful! 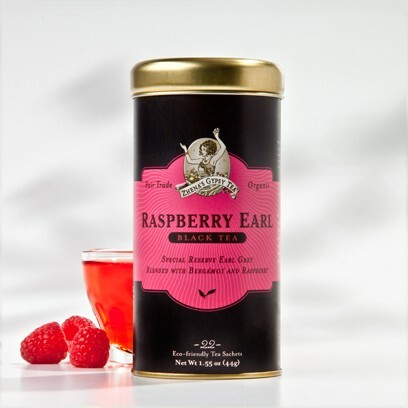 My personal favorite tea from this line is the Raspberry Earl black tea. Last year I tried this line of tea's while I was at a camping retreat about 90 mins from here. The camp mess hall had the entire line and the teas were fantastic. 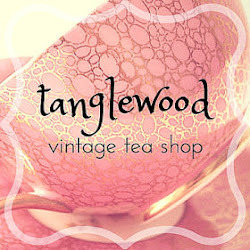 Organic and Ethically sourced these teas were creative and delightful to the palate. My morning go to at camp was the Raspberry Earl. I found myself looking forward to it in the crisp morning air. I was pleased to see I could find the tea at Whole Foods near where I lived. In Canada you can also order it on line from Well.ca in the USA you can find it at World Market and on line by clicking here. 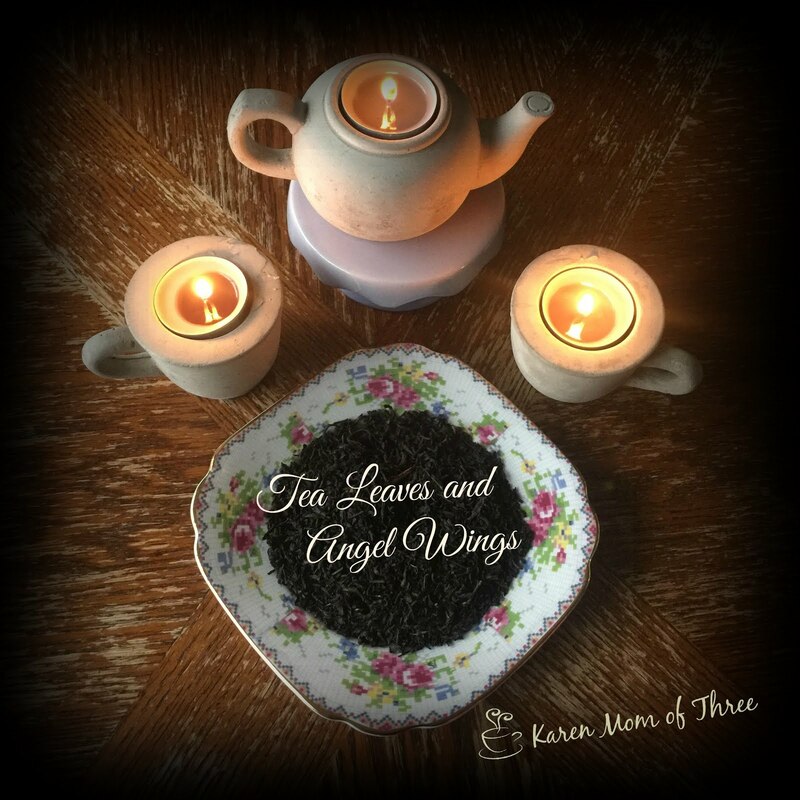 To learn more about this tea line please visit the Zhena's Tea website by clicking here. 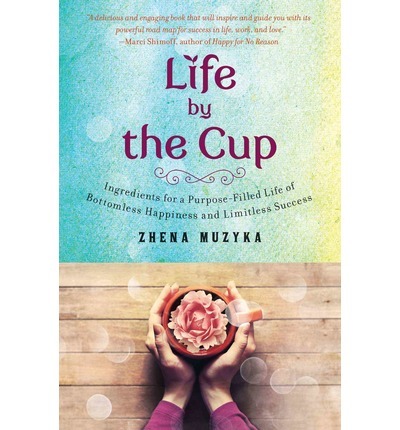 To order a copy of Life By The Cup with free shipping from the Book Depository please click here. To order it from Amazon please click here. 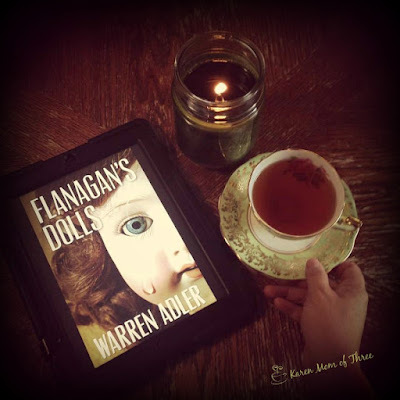 Tuesday night I read Flanagan's Dolls by Warren Adler. As a doll lover I jumped at the chance to read this book by acclaimed author Warren Adler, with a cover like this who could blame me! I did not know what to expect with this cozy and I will admit the cover of the book both intrigued me and scared. Not the normal cozy covers I am used too. The story however is a good one. The mystery behind the dolls and the family that owned them was complicated and well layered. I found myself constantly questioning motive and opportunity along with Flanagan himself! The characters are well developed and interesting. 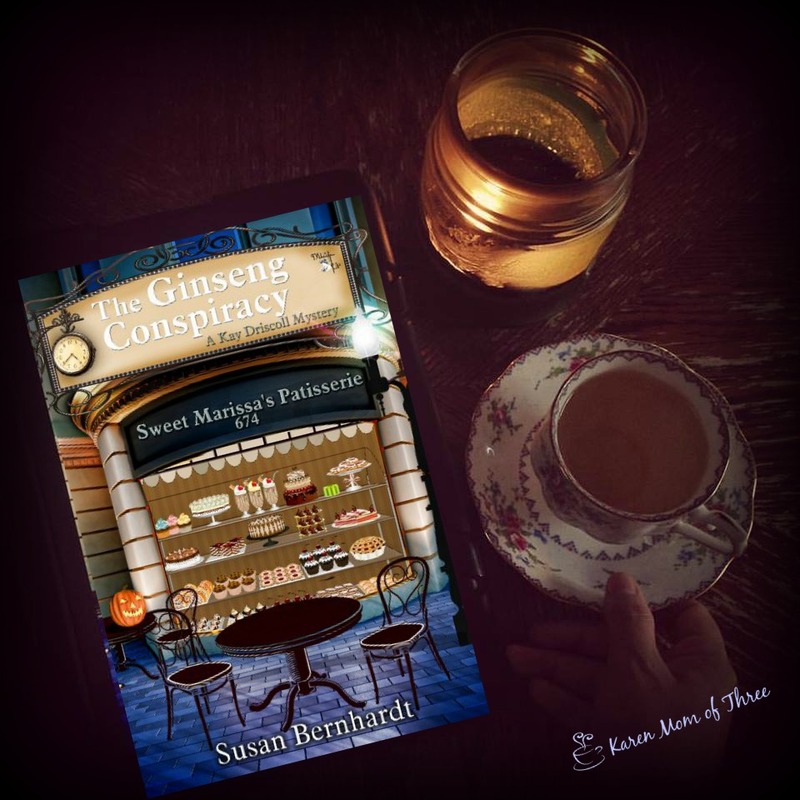 I have been asked on social media is this really a cozy mystery, and yes it is, though the main character is a male, it still has the feels that cozies create. I love the dog companion in this story and of course as a doll lover, the healing power of doll play. 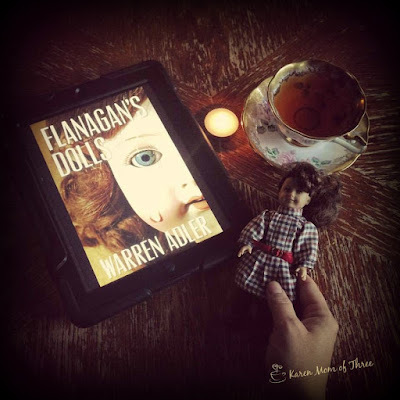 Even if you are not a doll lover but a mystery fan you will be delighted with Flanagan's Dolls. Josh and Emily Flanagan return to their hometown in upper Michigan where they open a funky antique shop which they hope will provide a sane and comfortable retirement. Both have pursued successful careers in Manhattan, she as an appraiser of antiques for an auction house, and he as an insurance adjuster in the field of art and antiques. 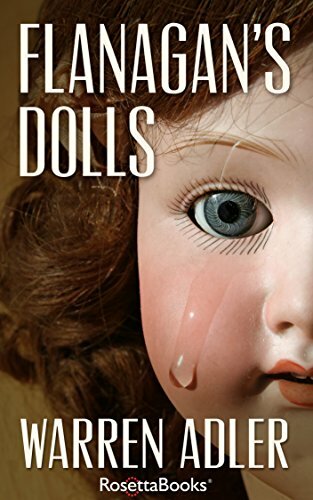 But when a man arrives seeking to purchase an antique doll for his ailing grandchild, the Flanagans unintentionally open up a Pandora’s Box of hidden family secrets and intrigue that results in bitter hostility and murder. Josh and Emily, through brilliant deduction and imaginative enterprise discover the clues that lead to the solution that lies at the heart of this mystery. To order your own copy of Flanagan's Dolls on Amazon please click here. Saturday and what a week it has been, I have actually been home now since Monday, what a great time I had! I love to go away but there is something about being home I think is fantastic and that I truly miss. My cat Squirrel seems to be the most put out by my leaving, though I hope she has mostly forgiven me now. We were in the State of Oregon, my husband and I. It was a great get away. We left the boys and the cats at home and headed for the eclectic and fun bookstores, fresh air of the Pacific North West and even got to fulfill a life long dream of visiting and being inside a lighthouse. A dream trip for sure and only about 6 hours from my home. Quite a delight for sure. I also had the great fortune to visit the Stash Tea Store and now I am wishing I bought way more then I did. I can order on line but the shipping will kill me! The Portland loose leaf Stash Blend was way beyond my expectations and perfectly reflects the state. You can taste the culture and the communities, the quirkiness and the sweetness of great outdoors in each sip. 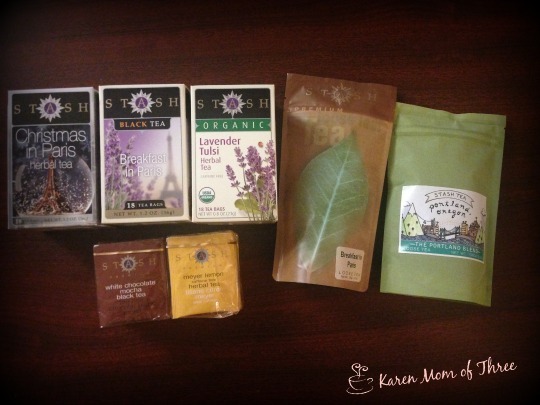 Click here to see how you can order your own from the Stash Tea Website. 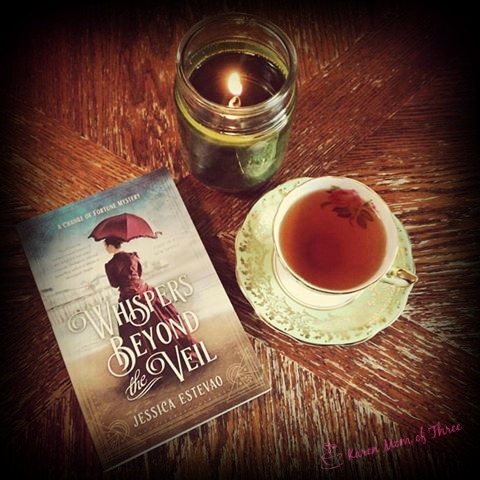 Monday we arrived home and waiting for me was Jessica Estevao's Whispers Beyond The Veil. I am looking forward to reading this one. Also waiting for me when I got home but on my Kindle App was Warren Adler's cozy mystery Flanagan's Dolls. This book is out now and as a Doll lover this book appeals to me. Tuesday's mail brought some lovely treasures from my friend Lisa! 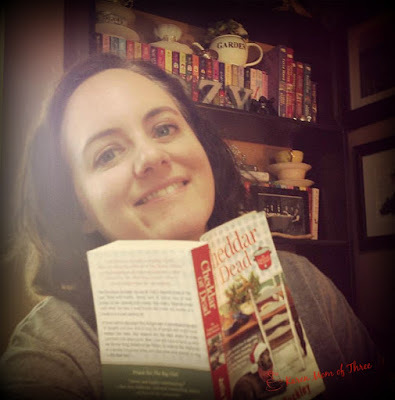 I love the napkins and watching my TBR pile grow! Wednesday the mail man dropped off 8 more lovelies to my pile. Not hard to dive into this bunch. I am so excited to read some familiar series and some that are totally new to me. So hard to know where to start! Great problem to have! Thursday brought me my friend Lisa's suggestion of Susan Bernhardt's The Ginseng Conspiracy! Good friends, tea, pastries and set at Halloween this one looks really good! I hear it is also out in paperback now too! Meet Your Baker By Ellie Alexander, A Fantastic Book And Series! I have been home now a few days and the second book I read while on vacation was Ellie Alexander (Kare Dyer-Seeley's) Meet Your Baker. If you read yesterday's post you know that I searched 6 book stores to find it and boy was it worth the search! This book first came out in 2014 and there are 4 current books in this series, one more coming out later this year. 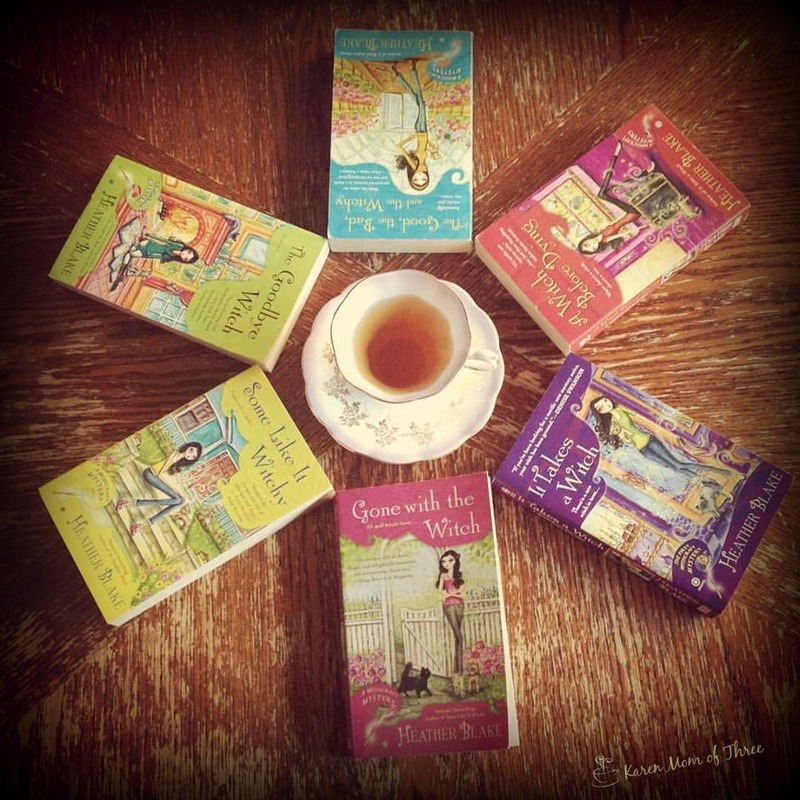 I am so glad that my friends recommended this series to me and it was such a delight to track them down and read them. I am also thrilled that my trip coincided with meeting the author Ellie Alexander. Hearing her speak about her series was a truly special and unique experience for me. The book it's self was absolutely charming. The realization that this series is based on a real place you can actually visit (though I was assured that the characters are purely fiction and that the lay out of the town differs slightly from the real Ashland Oregon) made this series just that much more real for me. Being in the state that the book was written about made it even more special. I loved the characters in this book, they are so well established, the back grounds, the history and the Shakespeare, along with the mouth watering food suggestions and recipes is more then endearing, it is exciting. Discovering this well written and well thought out series was a highlight of my summer. I am so looking forward to reading and reviewing more of this series, I hope you will join me in read it as well! 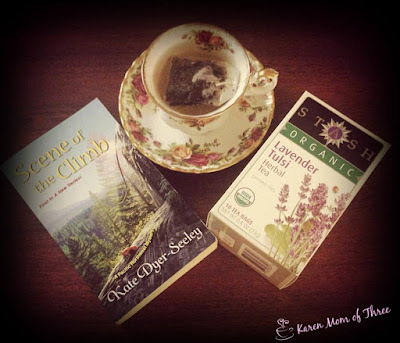 When I was in Oregon, I stopped by the Stash Tea store and picked up their special loose leaf Portland Oregon Blend. I wish I bought a case. 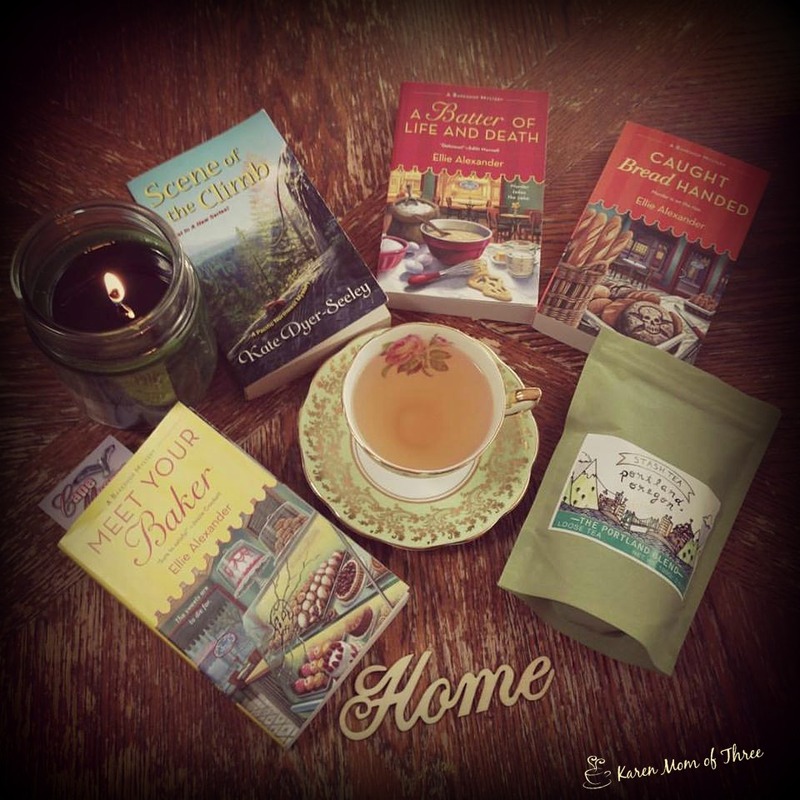 This tea is fantastic and will always taste to me like a cup of vacation. 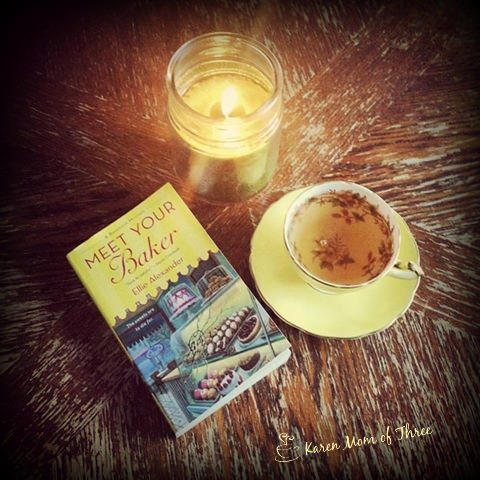 You can order your own copy of Meet Your Baker from The Book Depository with Free shipping by clicking here. 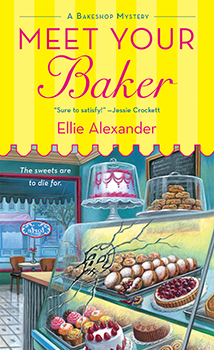 Learn more about Ellie Alexander and her Bake Shop Mystery Series by clicking here. 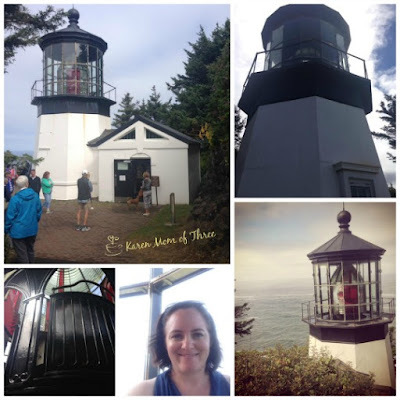 A Trip To Oregon and A Review Of Kate Dyer-Seeley's Pacific Northwest Mystery Series! For the last week I have been traveling, a bit of a cozy adventure get away with my husband, to Portland Oregon. This week long get away was a delight and I am thrilled to say it was full of trips to the book store and lots of time reading in the hotel room to beat the 40 degree (80's for my American readers). 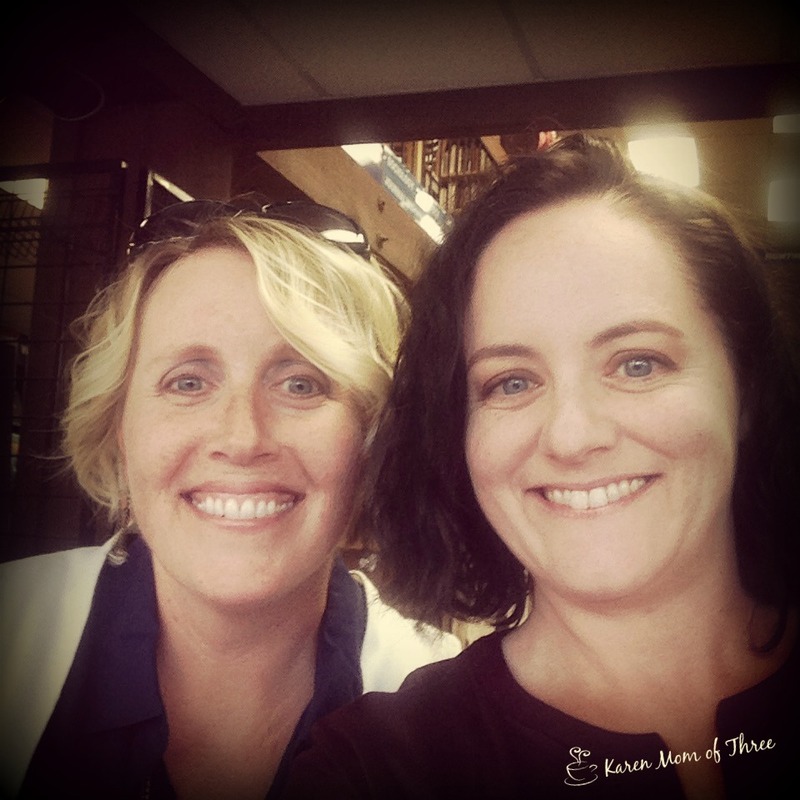 Oregon has some amazing book stores and on our first night here I went to the Book Bin in Salem (South of Portland) to meet and listen to author Kate Dyer-Seeley (AKA- Ellie Alexander). While my cozy best friends have all read her work for me this adventure was brand new and I tracked down her books at the book stores down here to read on our trip. 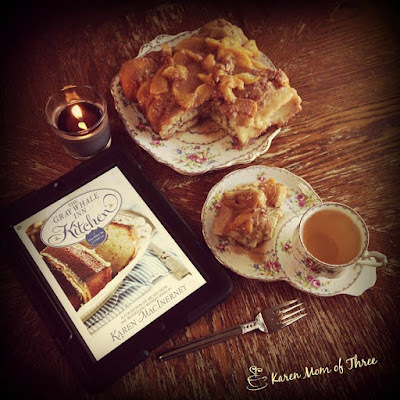 I had intended to read the Bake Shop Mystery series but it was the way that Kate talked about both her series that endeared me to the Scene of the Climb her first book in the Pacific Northwest Mystery Series. This is the first book in a three book series with the 4th book coming out in December. I finally tracked a copy down at my 6th book store and second Powell's books location. Portland, Oregon, is the perfect fit for someone like Meg Reed. It's a city with a small town feel, where she can crash on the couch of her best friend Jill, now that she's graduated from journalism school. . . But a girl needs a job, so Meg bluffs her way into writing for Northwest Extreme magazine, passing herself off to editor-in-chief Greg Dixon as an outdoor adventure enthusiast. Never mind that Meg's idea of sport is climbing onto the couch without spilling her latte. So when she finds herself clawing to the top of Angel's Rest--a two-thousand-foot peak--to cover the latest challenge in a reality TV adventure show, she can't imagine feeling more terrified. Until she witnesses a body plummet off the side of the cliff. Now Meg has a murder to investigate. And if the climbing doesn't kill her, a murderer just might. 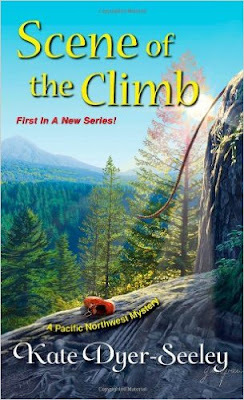 You can order your own copy of Scene of the Climb from The Book Depository with free shipping by clicking here. I truly enjoyed reading this on my trip. Being in the state it was written about made the book even more alive. The characters are well developed the setting, theme and mysteries are so good and so well researched that you can tell that this story is written by someone who truly loves and grasps the feel and energy of this state. I was very impressed to meet Kate and delighted by her humor, talent and energy. I highly recommend this book to anyone who loves the great outdoors, and to anyone who loves the great outdoors from the comfort of their reading chair like I do! I really enjoyed main character Meg and her friends, I can relate to her less then athletic abilities and her clumsiness. I believe that this is a series I will happily read and enjoy for many books to come. 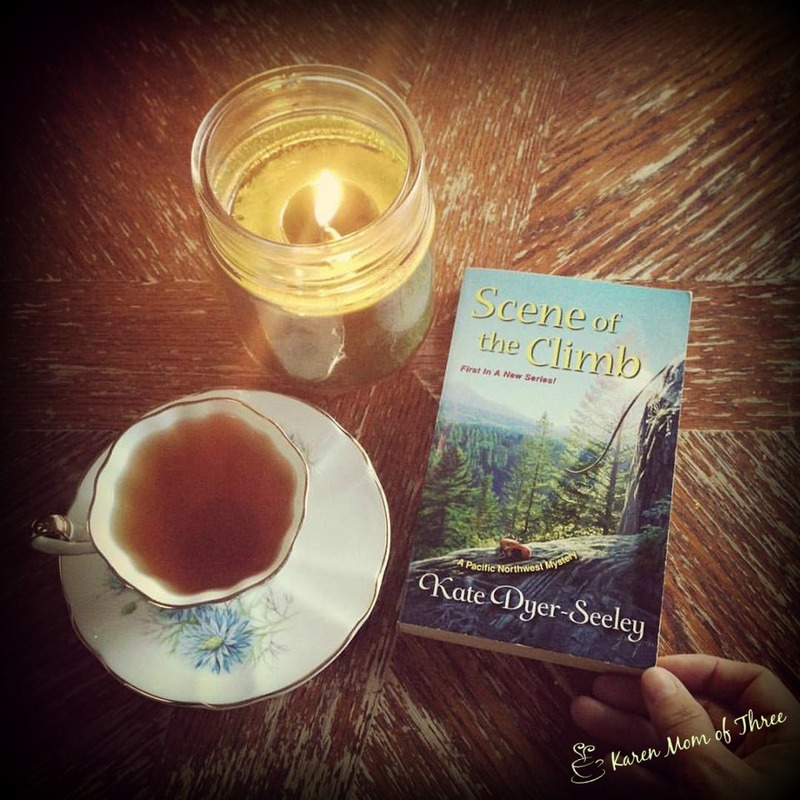 To learn more about this series please click here for Kate Dyer-Seeley's Website. On a tea note, Stash tea is located in this area and I may have filled my bag with lovely teas to enjoy, shown here is one of the new to me varieties I chose while in store. Lavender Tulsi was a lovely herbal tea, refreshing and invigorating this tea is made with Tulsi (Holy Basil) and lavender like its name and it does taste like heaven! 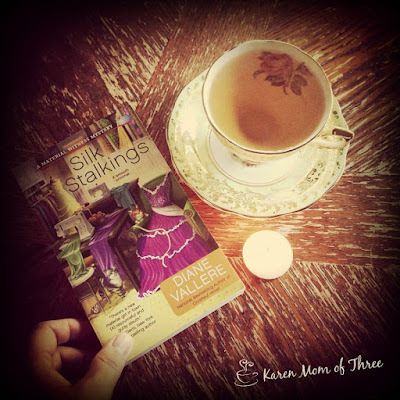 I was sent Silk Stalkings the third book in the Material Witness Mystery Series by Diane Vallere to review. In this mystery main character Poly (her name is actually Polyester Monroe!) gets roped into helping with the towns pageant. 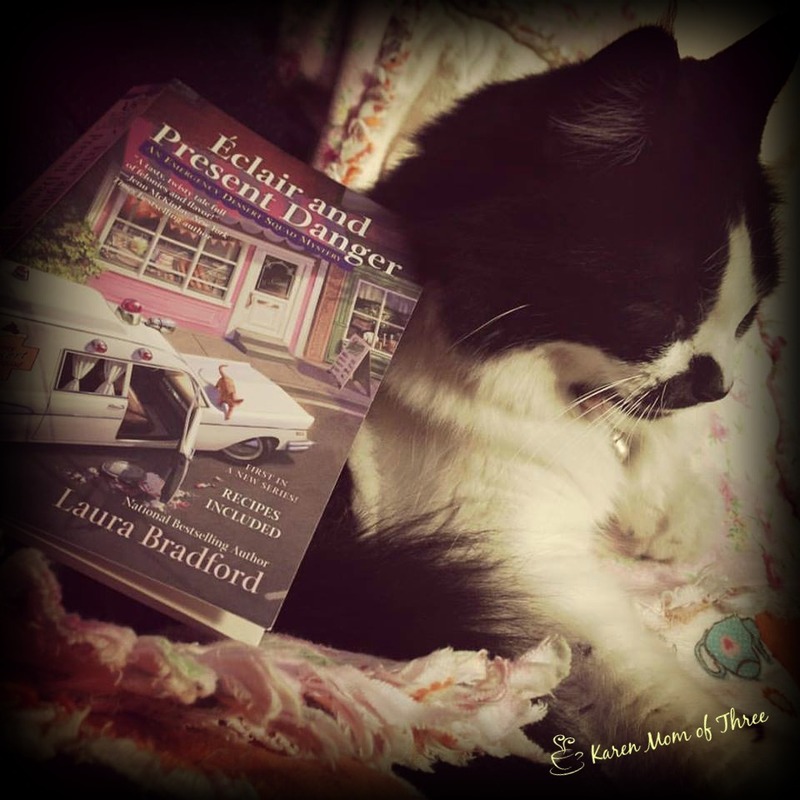 I loved the names in this series and the cats in the book Pins and Needles are such fitting names! 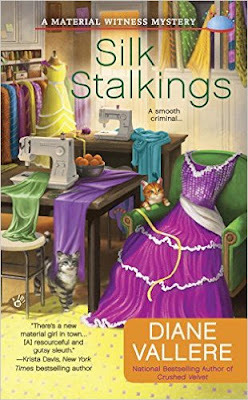 When one of the towns most important citizens winds up dead just days before the pageant contestants are announced Poly finds herself busy with not only the pageant contestants and sewing but also defending her friend Charlie. Poly has to work smart and fast in this cozy mystery fans of the series are going to love. I also enjoyed the instructions on how to make a garment bag provided in the back of the book! 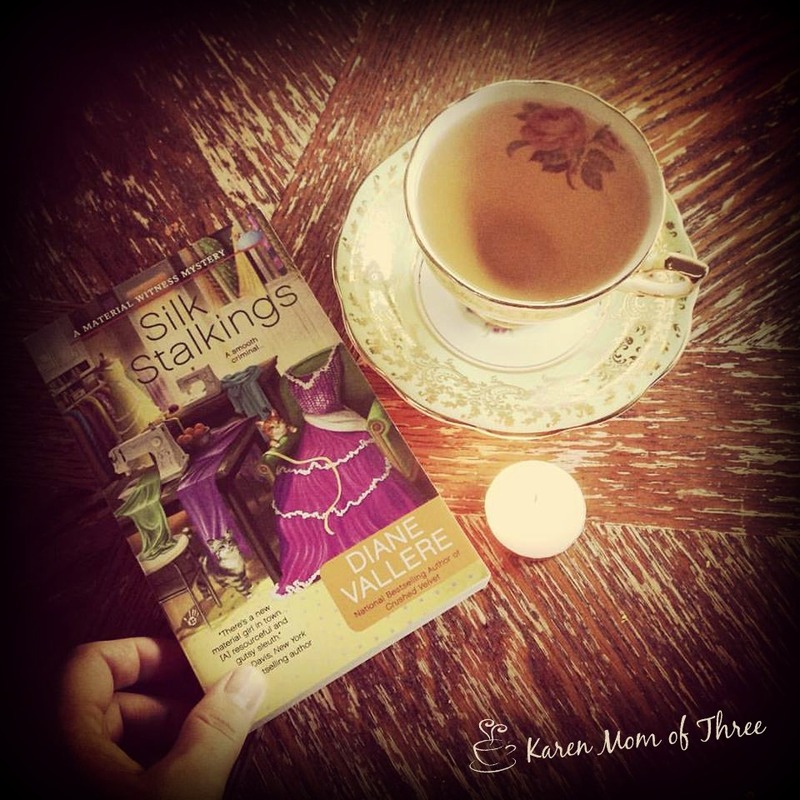 To order Silk Stalkings from Amazon please click here. Learn more about this series and Diane Vallere please click here. 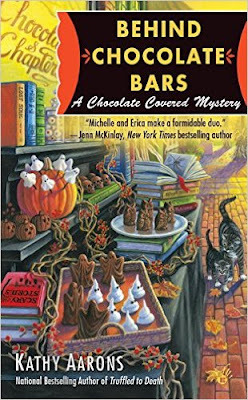 A week ago Monday I finished reading Kathy Aarons October 4th release, Behind Chocolate Bars, the third book in the Chocolate Covered Mystery Series. 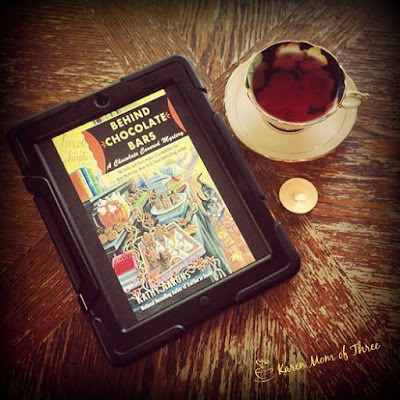 I found myself to be keenly interested and emotionally invested in this story of an unlikely sleuthing team of book store owner and chocolatier. I read book one but not book two in this series, somehow missing it and yet even though I had not read book 2, book three flowed very naturally and was I familiar enough with the characters to quickly fall into step. I like the concept of this series, the community involvement, the relationships that the duo Michelle and Erica, have with the local teens and with each other. 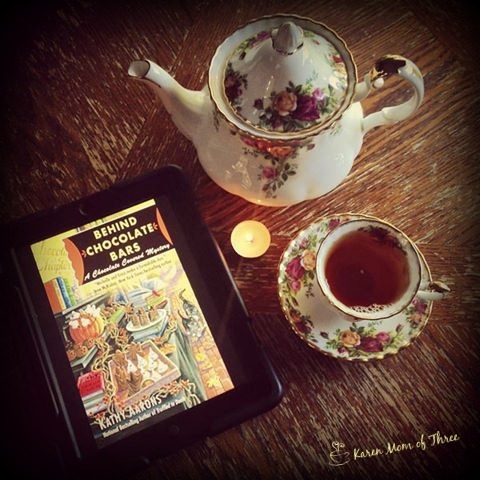 I like the love interests, I love the mysterious relationships and I love the chocolate too! Kathy does an amazing job with the character of main character Michelle's brother Leo, who has a fantastic story line himself. He is a wounded veteran, who suffers from PTS and that story line feels very real and raw in this very emotional side of the story. It is a good story, it is an important story and this cozy mystery is a series to love and grow with. 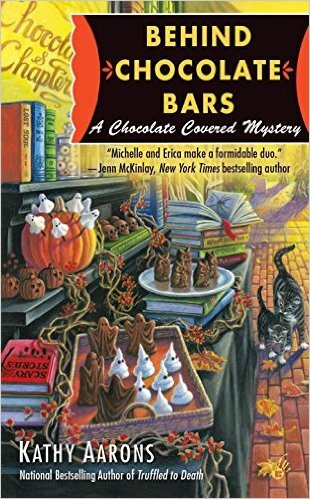 Behind Chocolate Bars comes out October 4th and is a Halloween themed cozy not to miss! Click here to find it on Amazon. Learn more about Kathy Arrons and her writing by clicking here. 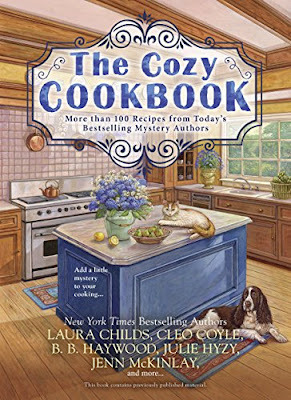 The other day my friend Lisa and and I were talking about the wonderful recipes that cozy mystery authors come up with, that can be found in the back of so many of the cozies we read and enjoy. She was telling me about her collection of cook books from cozy mystery authors and we got to talking about collecting and using these fun books. 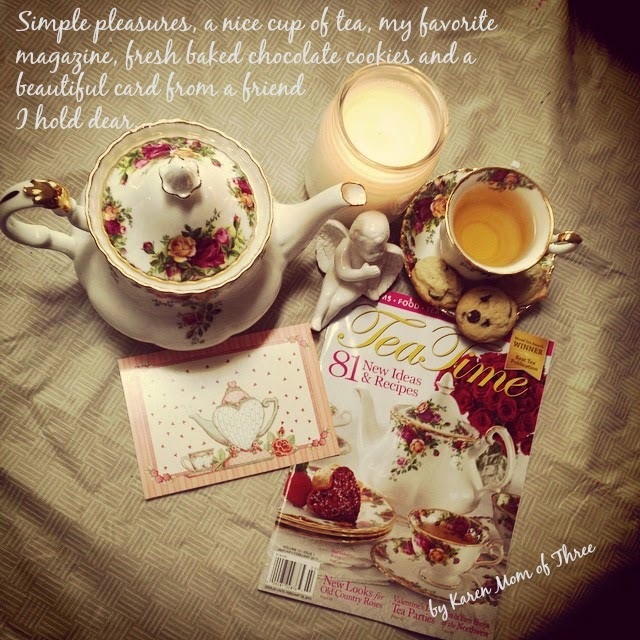 I will admit the only one I have is an E- Copy I bought of Tea Time With The Cozy Chicks. I was so excited when this downloaded on to my Kindle App the morning it was released I quickly devoured it! I am actually regretting not purchasing a paperback copy of this book! Our conversation started over my love of the recipe I found and made in The Gray Whale Inn Kitchen by Karen MacInerney. I loved this book and the idea that these recipes and ideas offered to us by those who write in the cozy world, actually turn out! 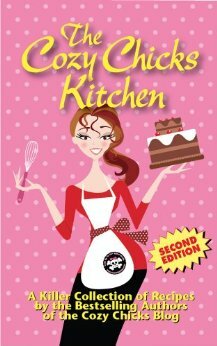 One I am simply in love with the cover of is The Cozy Cookbook with recipes by Laura Childs, Cleo Coyle, B.B. Haywood, Julie Hyzh, Kenn McKinlay and more. 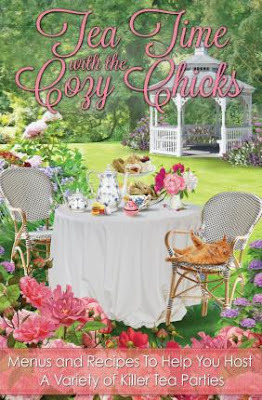 I don't think any cozy mystery book could have a cover I found more fitting. 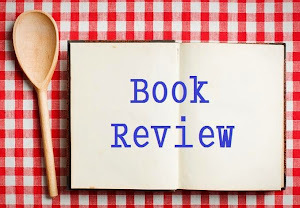 So that brings me to the question of do you my dear readers have a favorite recipe or cozy recipe book that you have found in our wonderful genre? 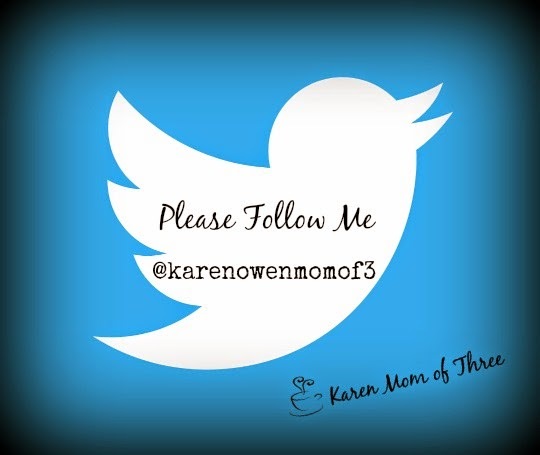 If so please leave me a comment below or email me and let me know what I need to add to my kitchen shelf! 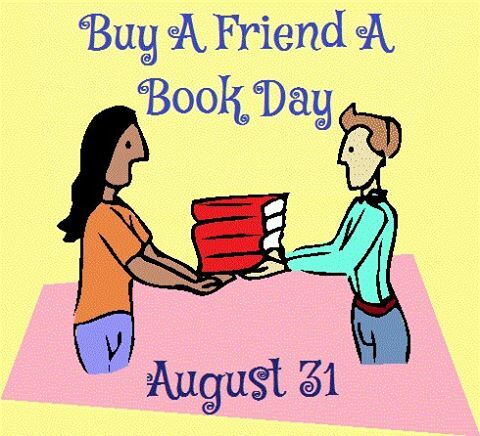 Buy A Friend A Book Day Suggestions! 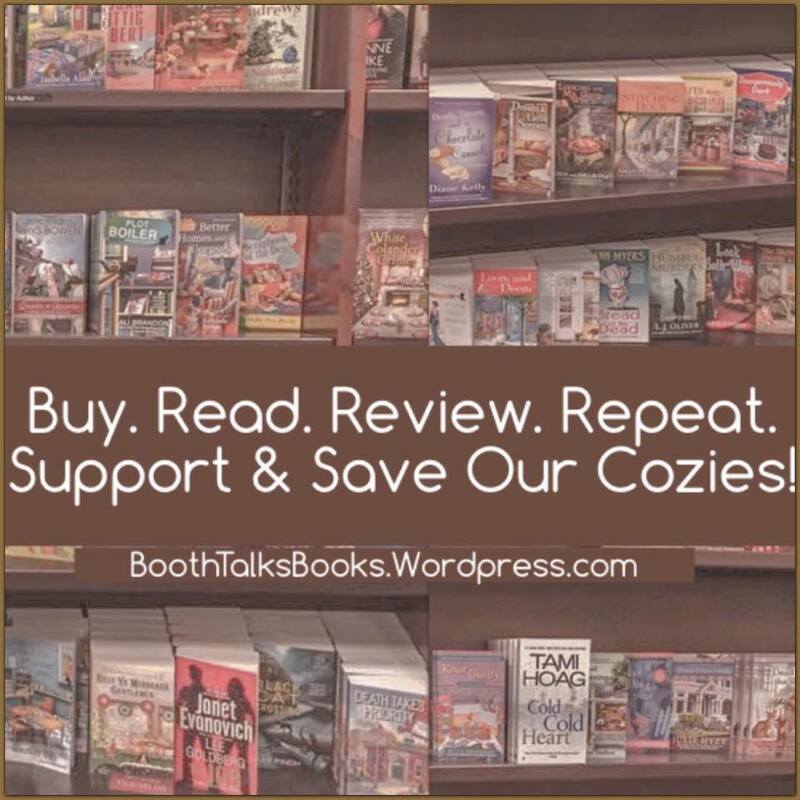 August 31st is fast approaching and I have some cozy suggestions for you of books you can purchase and give to friends! I love this new-ish holiday. 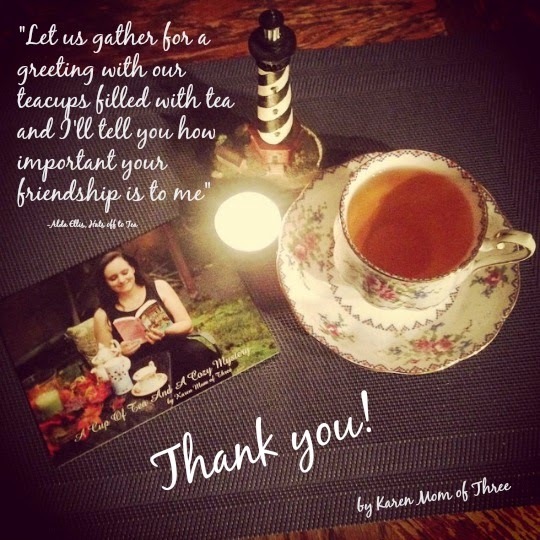 I have participated the last three years and I have joined a swap with friends this year on Elfster which lets the friends create a wish list of books. When you have friends like I do who read constantly it is often hard to choose a book for them that they may not have already read so this year Elftster is a God Send! 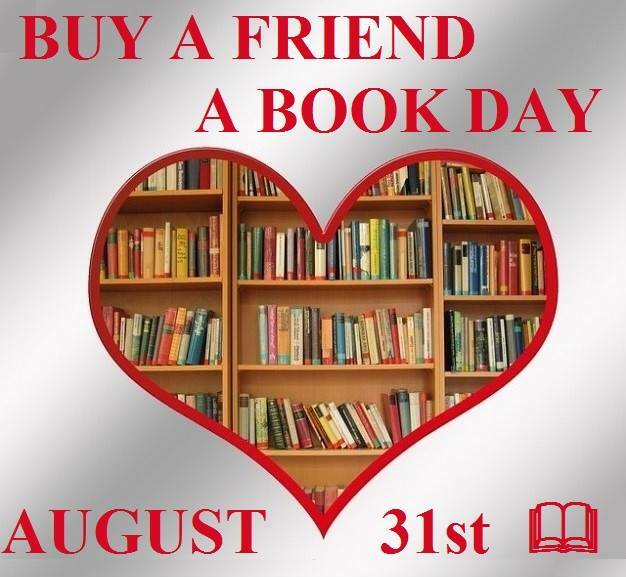 For those of you who may not be familiar with Buy A Friend A Book Day this is a fun day where you simply buy a book you think a friend would like on August 31st and give or send it to them. 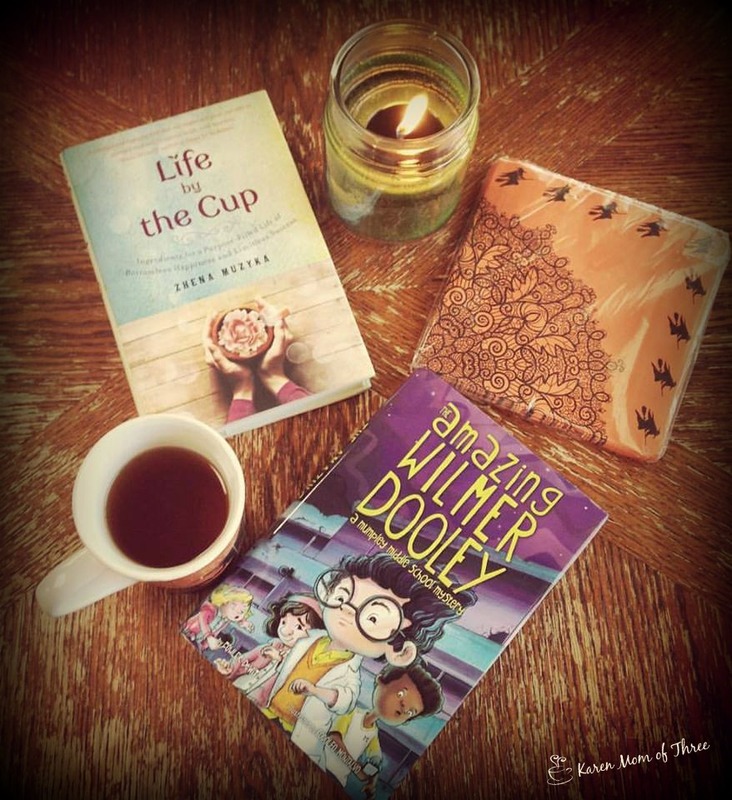 This holiday event is meant as a fun way to share a love of books and reading with others. You can purchase on line (with free shipping) from The Book Depository to send to friends far away or you can purchase a book at a small independent book store (Which is also a very good idea!) and then give it to your friends. If you are stuck on ideas of great cozy mysteries to purchase for friends I have more then a few suggestions here on my blog and you can find reviews and photos of all the books I have read and reviewed in the tabs at the top of my blog! I hope you enjoyed just some of my favorite books and series suggestions and that you may consider joining me in celebrating Buy A Friend A Book Day this August 31st! Saturday morning and a week in review to share. 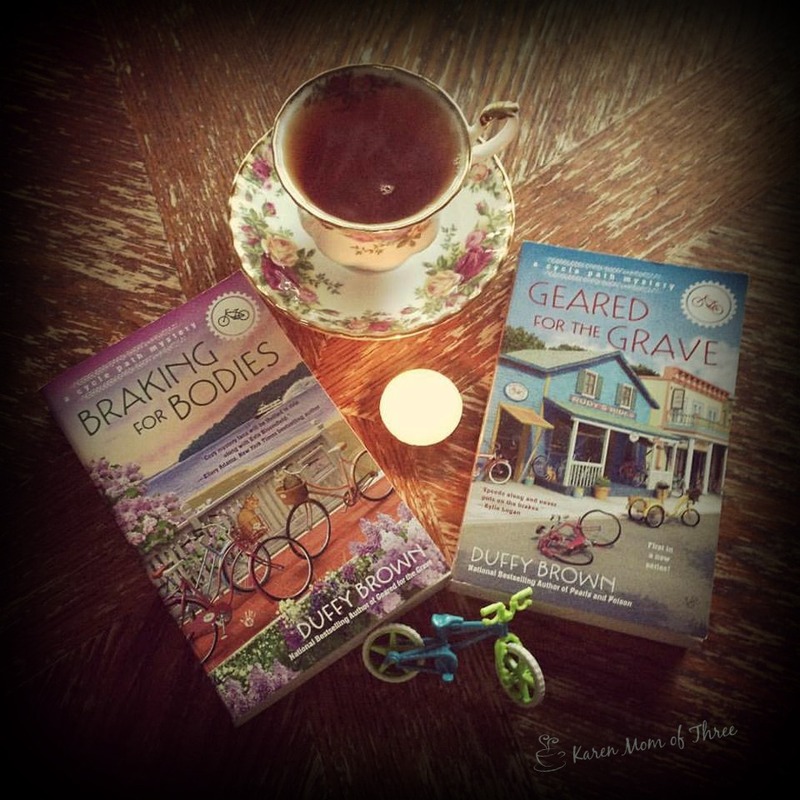 This passed Sunday was Author Duffy Brown's birthday and her Cycle Path Mystery Series is one I discovered and devoured earlier this year, I highly recommend this cozy series and celebrated her birthday by creating and posting this photo on Facebook. If you have not yet checked out Duffy Brown's mysteries I am officially encouraging you to do so. 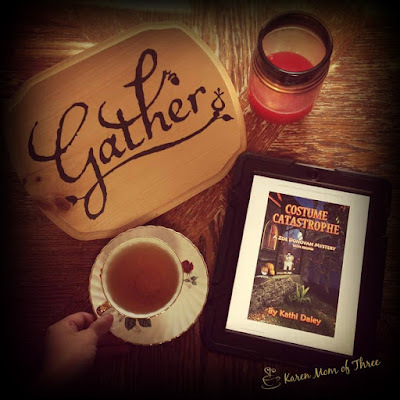 Reading Kathi Daley books as often as I do, I feel a calm take over and quickly settled in for what is always a great story, a fun mystery and a cozy delight. Costume Catastrophe is out now and ready for immediate download. 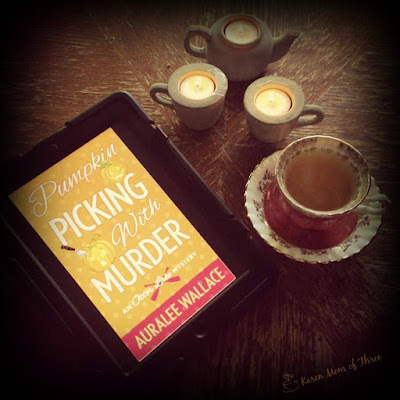 One of the funniest and most entertaining cozy mystery books I have ever read, Pumpkin Picking with Murder is out August 30th and was such a delight to read. 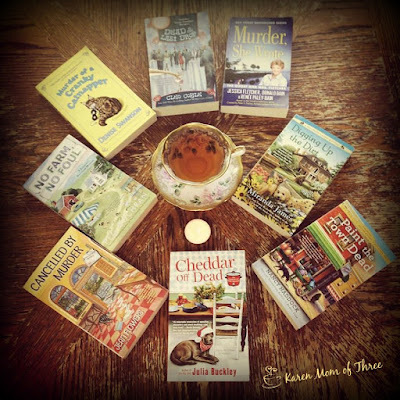 If you have yet to read the first Otter Lake Mystery called Skinny Dipping with Murder, you must treat yourself to both of these funny cozy mysteries! 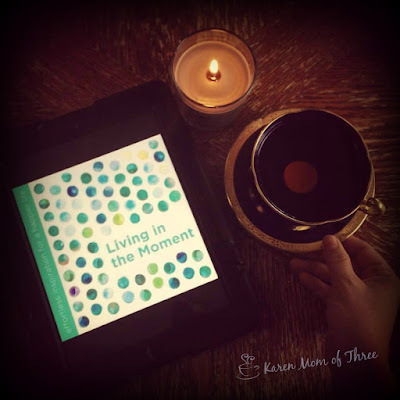 A September release Living in the Moment by Danni DiPirro, was a wonderful book of reminders of how important it is to be mindful of the moment. 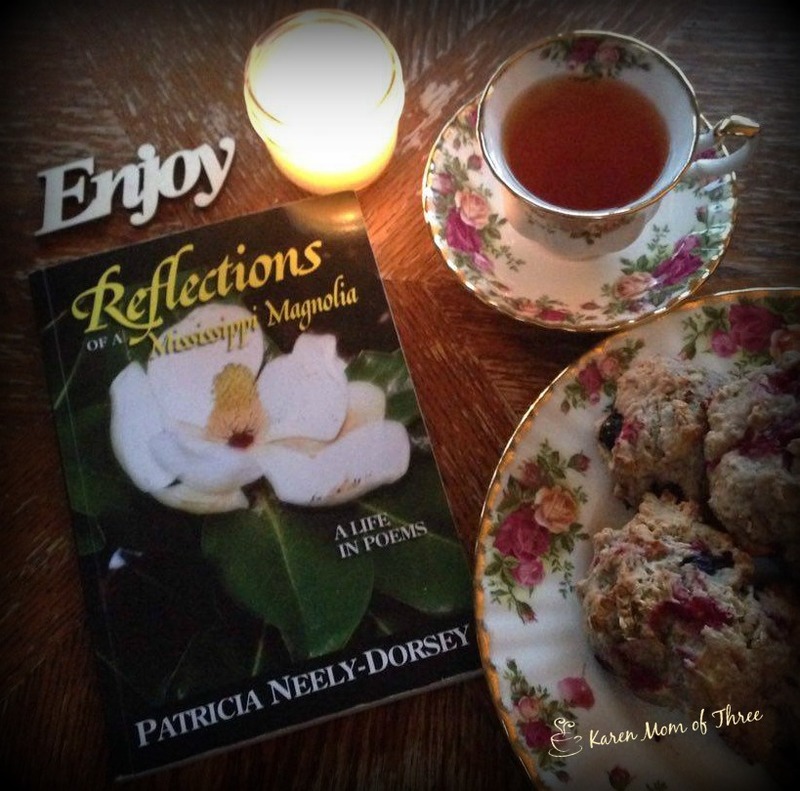 A very quick read and a lovely book you can gift to yourself or to others. 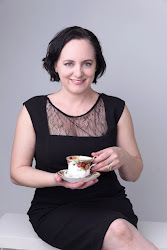 It was delightful to have Author Sarah Fox join me for a release day cup of tea of The Crepes of Wrath, first in a new series and a yummy themed cozy series at that! I look forward to more stories to come from this "West Coast" based Series!